beetroot ki sabzi recipe - easy and healthy dry beetroot curry prepared in south indian style. rinse the beetroot first very well in water. then add 2.5 cups of water in the pressure cooker. add the beetroot. sprinkle 1/4 teaspoon of salt. pressure cook the beetroot for 3 to 4 whistles or for 7 to 8 minutes. once the pressure drops down in the cooker on its own, remove the beetroot. you can use the water in soups, dals, rasams or to knead chapati dough. when the beetroot, become warm, peel and chop them finely. heat a pan and then add 1.5 tablespoons oil. when the oil becomes hot, reduce the flame to a low. then add ¼ teaspoon mustard seeds, ½ teaspoon cumin seeds, a generous pinch of asafoetida, 2 broken dry red chilies, 10 to 12 curry leaves and ¼ teaspoon turmeric. saute until the mustard seeds and cumin seeds crackle on low flame. then add 1/4 cup of finely chopped onions and 1 to 2 finely chopped green chilies. sprinkle salt as required. stir well. add the boiled, chopped beetroot. mix and stir well. cover with a lid and cook for 2 to 3 mins on a low flame. since the beetroot is boiled, no need to cook the beetroot sabzi for a longer time. remove the lid, stir the beetroot sabzi. finally add 1/4 cup of fresh grated coconut. stir well. after 1 to 2 mins switch off the flame. 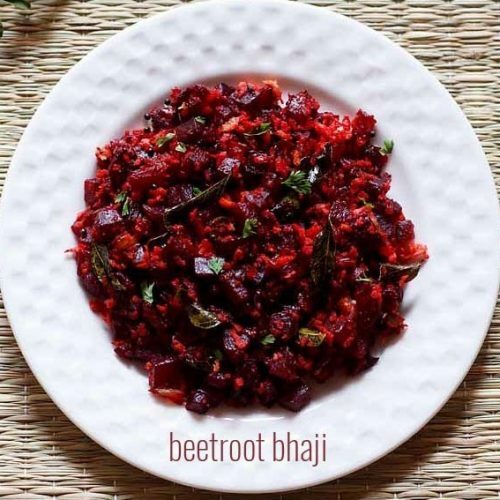 serve beetroot sabzi as a side dish with your meals. you could use raw beetroot also for this recipe. but it will take a longer time to cook. if using raw beets, then finely chop or grate them. add some water to them while cooking. cover and cook them. if you don't have fresh coconut then use desiccated coconut. desiccated coconut also tastes good in the beetroot dry curry.